TheArmenianKitchen.com : Love chocolate? Head for Armenia now! I always thought of chocolate as Armenian when I was growing up because it was probably my mother's favorite food. "Chocolate gives you energy," she'd say, nibbling a Hershey Bar or Tootsie Roll. It was probably the only really bad advice Mom gave me. She was blessed with incredible natural energy -- and a furnace-like metabolism, so all those sugary treats just melted away like...well, sugar. I, on the other hand, can't exactly hide the evidence of my life-long chocolate addiction, although I take comfort in all the recent news about the heart-health and other benefits of dark chocolate eaten in moderation. Now comes word that Armenia is becoming a chocolate wonderland. 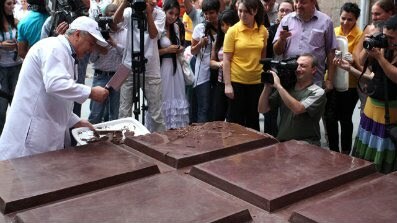 The Grand Candy Company has crafted the world's largest chcolate bar, certified by the Guiness Book of World Records. It's 224 inches long, which means it's just about as long as a hulking Chevrolet Suburban SUV -- but at 9,702 pounds it weighs about half-again as much. That must be some rich chocolate! According to the Associated Press (whose photo appears at top), factory owner Karen Vardanyan says the special bar commemorates the company's 10th anniversary. It's all natural, and contains 70 percent cocoa mass. So in my book, it qualifies as health food. Better yet, it's free! The 10-inch-thick bar will be pieced-out on Oct. 16 to anyone who happens to be in Yerevan that day. My advice to the lucky folks back in the homeland is simple: Moderation. In this case, I think the meaning is perfectly clear: Save some for me! Very funny. Not a big chocolate fan, but this heart friendly stuff has me interested.